We’re excited to welcome you to the Maverick family by inviting you to our 2019 Admitted Student Day, an exclusive event celebrating your acceptance. Visit the academic colleges to explore different majors and minors that you’re interested in studying at UNO. You’ll meet current students, faculty, and advisors who can give you an idea of what it’s like to be a Maverick. Visit two or more colleges and enter a raffle to win a laptop or one of three $100 book vouchers! Learn more about student involvement and support services at UNO through informational sessions, panels, and open houses in the Milo Bail Student Center, along with campus and housing tours. Behind the scenes tour of Baxter Arena leaving from the main floor of the arena at 8, 8:15, 8:30, 8:45, 10 A.M.
Come see what goes on behind the scenes at Baxter Arena. Tour will include an inside look at the locker room and training facility. Hear from UNO students, faculty, and staff and get excited to start your journey as a Maverick. 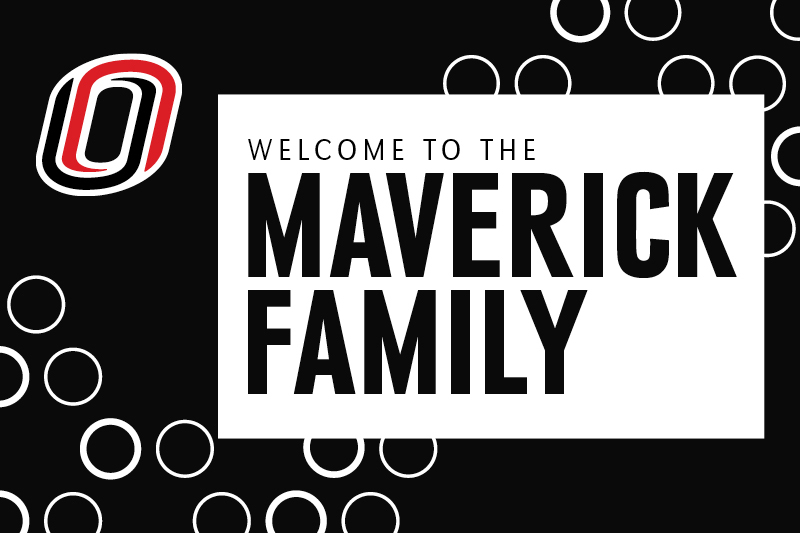 The UNO team store “Maverick Locker Room” will be open and the UNO Hockey team will be conducting tours of Baxter Arena. Jump on the shuttles and check out what each college has planned for the day! Hear from current University of Nebraska Medical Center students about their transition from UNO. Did you apply for the Susan Buffett Scholarship? Come and learn more about the next steps in the process. Not quite sure what you want to study? Looking at adding a double major or a minor? Connect with the brains behind the Academic and Career Development Center to learn how to make the most out of your time here at UNO. Exclusive to only those students who have been accepted into the Success Academy. The flexible Bachelor of Multidisciplinary Studies (BMS) program allows you to design an individualized program of study that connects what you’ve already done with what you’re preparing to do. Whether you attend part-time, full-time, online, or on campus, our dedicated advisors work with you to create a program that fits your life. Questions about the FAFSA, paying for college, scholarships, loans, grants, etc.? Come ask the experts and receive one-on-one advice. Sign up for your Enrollment Day. The Air Force Reserve Officer Training Corps (AFROTC) is an educational program designed to give men and women the opportunity to become Air Force officers while completing their degrees. Stop by to learn how this program is designed to prepare you to assume positions of increasing responsibility and importance in the modern Air Force. Studying abroad is one of the best investments that you can make for your future. It gives you the opportunity to explore new locations and ideas, broaden your perspectives and grow both academically and personally. With more than 1,000 options to choose from, there’s a study abroad program that’s right for you. Did you know that UNO is #1 in Nebraska for LGBTQ students? Explore how the Gender and Sexuality Resource Center fosters and promotes equity, access, and inclusion for all genders and sexualities through education, resources, advocacy, and activism. Questions about transfer credit, grades, class standing, enrolling in classes, etc.? Stop by our booth. We’re here to help! St. John Paul II Newman (JPII Newman) Center is a place where a UNO student's spiritual, residential, and social life come together. Located at 71st and Pacific Streets (1221 S. 71st St.), the 100,000 square foot facility is made up of three primary spaces: an oratory, community areas, and apartment-style housing. Come chat with us! Check out your new home on campus with a tour of UNO’s residence halls. It's time to start planning what you’ll need for your residence hall room. Come catch the shuttle and check out our model units to get some ideas! Take a stroll through campus with one of UNO's finest student Ambassadors. Enrich your college experience by getting involved! Come chat with representatives from Student Government, Maverick Productions, Greek Life, Dance Marathon, and more! Come stop by the office of Multicultural Affairs and learn about the inclusive initiatives happing across campus. Are you a military affiliated student? Be sure to stop by the Office of Military and Veteran Services to learn about your benefits package and other resources available to you as a student. The open house starts in the Milo Bail Student Center Ballroom (207) at 10:30 A.M. where students will receive a special passport to keep track of the different College of Arts and Sciences programs they explore. Visit with students, faculty, and staff across Allwine Hall, Arts and Sciences Hall, and Durham Science Center. Turn in your passport at any of the Maverick Admissions Express Check Out Stations to claim your prize! Experience all that the College of Business Administration has to offer. We'll be offering a breakfast social (10:00 – 10:30 A.M.) followed by a Dean's welcome (10:30 – 10:50 A.M.), student panel (11 A.M. – 12 P.M.), parent panel (12 – 12:30 P.M.), and behind the scenes tours of Mammel Hall (running from 10 A.M. – 12 P.M. every 15 minutes). Hop off the shuttle, enter the library and explore the College of Communication, Fine Arts, and Media! From free arts events to scholarships for participation, this session will help you learn about the activities that are available to ALL UNO students, not just majors. Sign up to learn more about opportunities to participate in music ensembles, theatre productions, MavRadio, MavForensics, and our amazing art and writing programs. Following a brief overview in the library, we will direct you to tour our buildings, meet the school directors, and learn how you can be part of the CFAM-ily! Health and Kinesiology Building – The School of Health and Kinesiology will provide new students with the opportunity to learn more about our degrees, including public health, kinesiology, physical education, and athletic training. Faculty and current students will host tours of our labs and other facilities, as well as provide hands-on activities for participants. Roskens Hall – In the RH Atrium guests will be able to chat with College of Education student groups and learn ways to get involved on campus and in their major. In the IDEAS Room (RH 412) students will create self-directed learning experiences through makerspaces with new Lego Mine Storms and so much more! In the UNO PLAY Lab (RH 408) the Early Childhood Inclusive Education program invites students and families to engage in hands-on early childhood learning experiences, meet professors, and learn about the different potential occupations graduates can enter with an Early Childhood and Inclusive Education (ECIE) degree and certification, and have questions answered regarding your interests. In the STEM Lab (RH 402) Omaha area elementary teachers will present their BODYMODELS posters, explain how they implemented biomechanics, and STEM curriculum into their own classrooms. UNO STEM faculty will be on hand to answer questions from visiting students. In RH 302 future Mavs will explore the COE Major Fair. Faculty representatives from the Teacher Education Department and Special Education and Communication Disorders Department will be present. The College of Education offers more than 13 majors including both teaching and non-teaching majors including Speech-Language Pathology, Sign-Language Interpreting, Library Science, Pre-Athletic Training, Public Health, Kinesiology, Special Education K-6 and 7-12, Secondary Elementary Education and Elementary Education and so much more. In RH 304 participants will be able to chat with Academic Advisors while learning by playing Advising Bingo. Looking to help, serve, and be a leader in your community? Then the College of Public Affairs & Community Service (CPACS) is for you! With many full degree programs along with a wide selection of minors and certificates, the College of Public Affairs and Community Service is here to help you build and serve your community. So, whether you are interested in one of our full degree programs or possibly just a minor to accompany any major at UNO, come check out CPACS today! We'll have a Q&A panel running from 10:30 – 11:30 A.M., and the rest of our programming will be open house style. Degree Programs: Bachelor of Multidisciplinary Studies, Bachelor of Science in Aviation, Bachelor of Science in Emergency Management, Bachelor of Science in Social Work, Bachelor of Science in Criminology & Criminal Justice, Bachelor of Science in Gerontology. Minors: Aviation, Criminology & Criminal Justice, Emergency Management, Fire Service Management, Gerontology, Nonprofit Management, Tribal Management and Emergency Service. Undergraduate Certificate Programs: Gerontology, Tribal Management, and Emergency Services. Come hear from current students about their experiences in the College of Engineering. Get answers to questions about majors, our summer activities to help students transition into the college and what life is like as an Engineering major. Session will include a short presentation and question/answer session with current engineering students, 10:30 – 11:30 A.M. and 11:30 A.M. – 12:30 P.M.
Want a lab tour of PKI? Stop in during your visit or before or after one of our info sessions to get an up-close look at the engineering labs in PKI. Lab tours will be led by current students. Find out what makes this place special! You're invited to explore our innovative programs and take a tour of our multidisciplinary labs! Visit with current College of Information Science & Technology students and faculty, all while touring the amazing facilities at the Peter Kiewit Institute. You can check out faculty and student lab demonstrations, visit with current students to learn about our student organizations, and tour the state-of-the-art facility. Happening at 10:30 A.M. – 12:30 P.M.